How does an apple and blueberry pie sound to you right now? Don't you think a freshly baked apple pie served straight out of the oven sounds divine? Would you care to have one? Not only that, I made them in pocket or mini sizes.. is that how I should put it? Instead of a large pie, I wanted them in individual servings. So everyone could have their little pocket of warm goodies. Each apple and blueberry pie will be served with chilled creamy vanilla bean sauce. I like how this simple pie can satisfy any crave. It somehow makes you feel warm, cuddly and would probably like to snuggle up under a throw over. This recipe does not really require you to have fresh blueberries. You can use canned or like me; I always keep a stash of the berries frozen in my freezer. So when you need some berry goodness, just take it out and whip up some muffins or bread or a mini pie. If you're feeling a little blue, or coldness of fall is kicking in; try baking some of these. Make some extras, and its good to freeze up to a month. Just heat up the oven and pop them in and bake till they are golden in colour. Serve them with your favourite custard sauce, or have them plain or with some good old fashion vanilla ice-cream. This will certainly help fight those cold nights, or kick some blues away. Till then!! I do have some frozen blueberries and this is a great recipe for them. A big pie is just not something I make due to our small family, so these little gems are perfect. Great touch with the vanilla sauce. Yum! 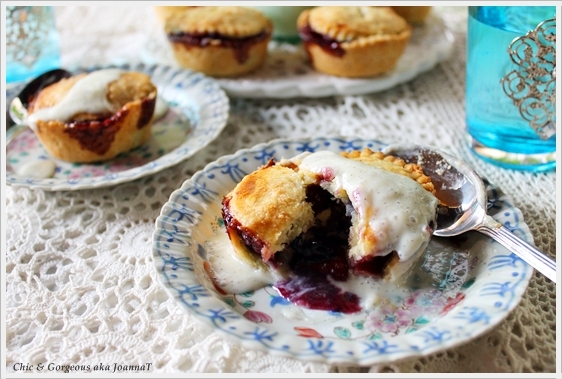 These little pies look so pretty and delicious, Joanna! That vanilla bean sauce sounds divine!! Btw, I gave you some awards on my blog this past weekend, go check it out! Oh my, these are so wonderful. I love your pics on this one. You just have a real knack for this. Love stopping by. Joanna - this is AMAZING! I love the idea of apples and blueberries together and in miniature? Wonderful! As always - your pictures are a feast for the eyes! Hi everyone! Thanks for leaving me with such sweet comments. Work has been overwhelming at my end, and I think this month I have been a tad slow with my blogging. Peggy: I was thinking the same thing too, glad you like it. For me it's summer everyday here, not that I'm complaining. Kelly: Heya! You stopped by my blog before my dear, thanks so much for your sweet comment. Make my day. I will work hard to keepup the work. Lilly: I wished you lived closer to me too, so I can always give you some of my goodies. I try my best to not make them ugly.. talk about being a pain to myself. Tina: Oh my! you made Top9 with your B52 cookies. Your are one fantastic baker.. so many top 9s. I'm in AWWWWWWWwwwE.. CONGRATS my friend. Stephanie: So sweet.. Virtual huggies, I will make time to blog about the awards.. THANKS so much for thinking of me. I really value that..
Kim Bee: Shucks, stop making me blush.. I couldn't help smiling.. thanks for the support. Nic: Really? Oh shucks... It can be rather chilly when it rains. I could still remember it.. Hahaha.. I WOULD LOVE to mail them to you now, can you tell immigration to let this go by? Hugs..
How adorable are these tiny little pies? Love the blueberry apple combo - but really its their mini-ness that I am gushing over. 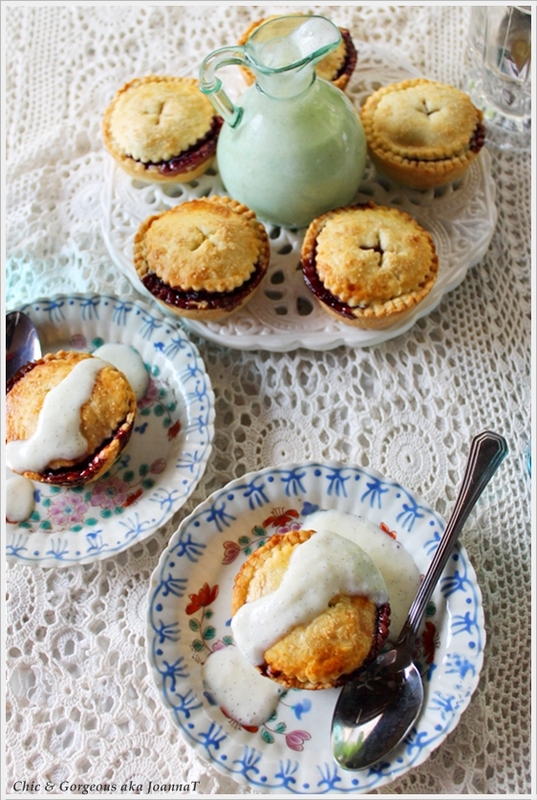 My stomach is now growling... those wee little pies are perfection! You are truly oh, so creative and talented, and tak such pleasure in your work with the amazing photos, as well! So cute Joanna and Congrats. I love that Vanilla Bean sauce. I'd get in so much trouble with that! I'm so happy to have found your amazing blog! Hey everyone! Thanks for leaving me with such supportive compliments. I will certainly keep up. I will be back soon, with more goodies. Just need to punch in a lot of work. Hahaha.. Thank god my boss doesn't read my blog :P. Till then..
P/S: Do stay in touch, always happy to hear from another foodie at heart. These pies look absolutely mouth watering. I’m going to try these on my family! The apple pie looks so good i crave for it right now thank you for sharing the recipe. 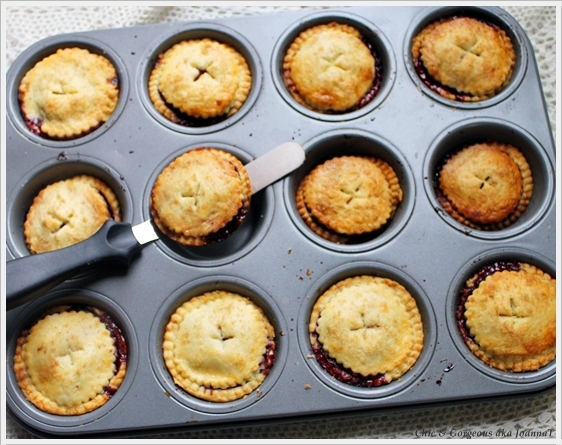 These pies are so adorable! They sound divine, especially with the vanilla bean sauce - can't wait to give these a go!